Finely dice one onion and half a garlic clove. Sauté both in a small frying pan in some vegetable oil until the onion is translucent. Cut basil into fine strips. Next, mix ground beef, breadcrumbs, egg, sautéed onion and garlic, basil, salt, and pepper in a bowl. Use hands to make small balls from the mixture, approx. 3 cm in diameter. For the sauce, dice the onion, carrot, half a garlic clove, mushrooms, and tomatoes. Sauté the cut vegetables in some vegetable oil. Add pureed tomatoes and season with sugar, salt, and pepper. Allow to reduce on a low heat for approx. 15 – 20 min. Meanwhile, finely chop rosemary and thyme. Next, add chopped herbs and meatballs to the tomato sauce and simmer for approx. 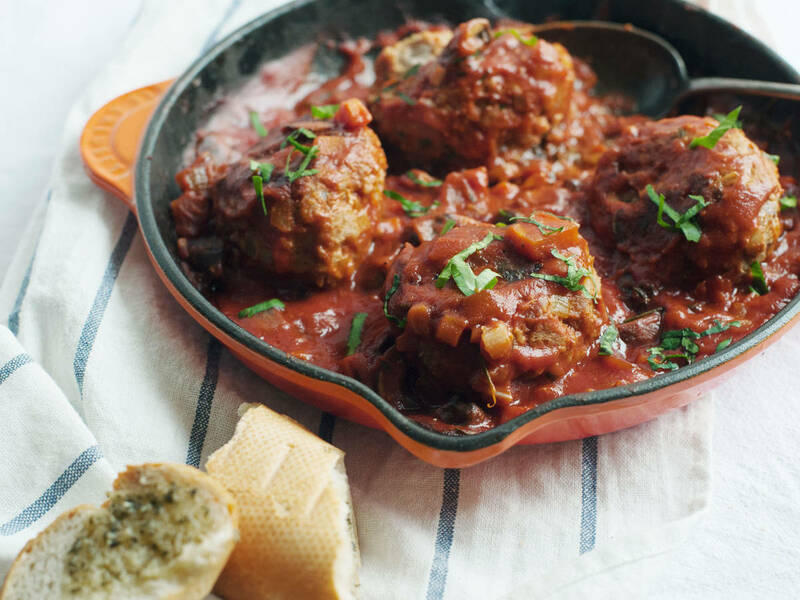 10 – 15 minutes with closed lid until the meatballs are cooked. Serve with rice or toasted bread.